Clyde Wayne Shepard was born on 13 January 1945 at Texas. He died on 5 February 1976 at Hospital in the Pines, Precinct 2, Morris County, Texas, at age 31; I have copy of death certificate. He was buried on 7 February 1976 at Clark Cemetery, Jenkins (near), Morris County, Texas. James W. Satterwhite was born on 28 November 1909 at Arkansas. He died in June 1963 at age 53. Eugene Satterwhite was born on 28 May 1913 at Arkansas. He married Louvonia (?) on 4 September 1941 at Gurdon, Clark County, Arkansas; I have copy of marriage license. Eugene Satterwhite died in November 1981 at Gurdon, Clark County, Arkansas, at age 68. Curtis Satterwhite was born on 6 August 1915 at Arkansas. He died on 28 March 1992 at age 76. Louvonia (?) was born on 4 April 1919. She married Eugene Satterwhite, son of William Erastus Eugene Satterwhite and Fannie Elizabeth Abston, on 4 September 1941 at Gurdon, Clark County, Arkansas; I have copy of marriage license. Louvonia (?) died on 13 February 1998 at Gurdon, Clark County, Arkansas, at age 78. Isham Johnston was born in 1860. He married Fannie Elizabeth Abston, daughter of James M. Abston and Sarah C. Adams, on 20 November 1921 at Clark County, Arkansas; I have copy of marriage license. Isham Johnston died before 1930. Moses Preston Satterwhite was born on 15 June 1894 at Sandtown, Independence County, Arkansas; date may be June 14, 1893. He married Sarah Elizabeth 'Lizzie' Pectol, daughter of Robert Henry Pectol and Sarah L. 'Sadie' Robertson, on 7 November 1915 at Hickory Valley, Independence County, Arkansas; I have copy of marriage license. Moses Preston Satterwhite died on 7 July 1960 at Newark, Independence County, Arkansas, at age 66. He was buried after 7 July 1960 at Center Grove Cemetery, Near Charlotte, Independence County, Arkansas; I have picture of grave marker. Moses Preston Satterwhite appeared on the census of 19 January 1920 at S.D.3; E.D.21; page 2A, Pauls Valley (Part of Brady Township), Garvin County, Oklahoma. He appeared on the census of 2 April 1930 at E.D.32-11; S.D.2; Sheet 1 A, Dota Township, Independence County, Arkansas; is age 36, married to Lucy and he is farming. Seven children are with them. Mary Elizabeth, the mother of Moses, is with them. Sarah Elizabeth 'Lizzie' Pectol was born on 18 December 1897 at Newark, Independence County, Arkansas. She married Moses Preston Satterwhite, son of David M. Satterwhite and Mary Elizabeth Henley, on 7 November 1915 at Hickory Valley, Independence County, Arkansas; I have copy of marriage license. Sarah Elizabeth 'Lizzie' Pectol died on 18 August 1981 at Batesville, Independence County, Arkansas, at age 83. She was buried after 18 August 1981 at Center Grove Cemetery, Near Charlotte, Independence County, Arkansas; I have picture of grave marker. Florence Mamie Satterwhite was born on 31 July 1916 at Sandtown, Independence County, Arkansas. She married Calvin Loyal Westerfield on 17 November 1934 at Jackson County, Arkansas; I have copy of marriage license. 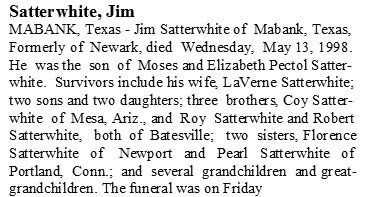 Florence Mamie Satterwhite died on 25 November 2000 at Newport, Jackson County, Arkansas, at age 84; I have transcribed copy of her obituary. See obituary. She was buried on 27 November 2000 at Walnut Grove Cemetery, Newport, Jackson County, Arkansas. Lockie Pearl Satterwhite was born on 2 September 1918 at Sandtown, Independence County, Arkansas. She married Andrew Lastrina on 4 March 1944 at Independence County, Arkansas; I have copy of marriage license. Henry David Satterwhite was born on 19 January 1920 at Paul's Valley, Garvin County, Oklahoma. He died on 1 May 1933 at Newark, Independence County, Arkansas, at age 13. James Daniel 'Jim' Satterwhite was born on 27 August 1925 at Newark, Independence County, Arkansas. He died on 13 May 1998 at Mabank, Kaufman County, Texas, at age 72; of cancer. I have transcribed obituary. See Obituary. He was buried on 15 May 1998. James Daniel 'Jim' Satterwhite had 2 boys and 2 girls with Edamay. Lucy Jane 'Janie' Satterwhite was born on 27 August 1925 at Newark, Independence County, Arkansas. She died on 27 November 1983 at Batesville, Independence County, Arkansas, at age 58. She was buried after 27 November 1983 at Center Grove Cemetery, Near Charlotte, Independence County, Arkansas; have picture of grave marker. John Satterwhite was born on 12 December 1927 at Newark, Independence County, Arkansas. He married Billie Jean Gartland, daughter of Willie Abner Gartland and Mabel Taylor, on 27 May 1949 at Newark, Independence County, Arkansas; I have copy of marriage license. John Satterwhite died on 30 June 1985 at Batesville, Independence County, Arkansas, at age 57; of cancer. Robert Howard Satterwhite was born on 10 September 1937 at Newport, Jackson County, Arkansas. He died on 15 August 2002 at White River Medical Center, Batesville, Independence County, Arkansas, at age 64; I have transcribed obituary. He was buried after 15 August 2002 at Center Grove Cemetery, Near Charlotte, Independence County, Arkansas; I have picture of marker with his parents. Sarah L. 'Sadie' Robertson was born on 10 December 1880 at Arkansas. She married Robert Henry Pectol on 17 January 1897 at Independence County, Arkansas; I have copy of marriage license. Sarah L. 'Sadie' Robertson died on 12 May 1964 at age 83. She was buried after 12 May 1964 at Pleasant Hill Cemetery, Sulphur Rock, Independence County, Arkansas. Robert Walter Lane was born in 1855 at Alabama. He married Estelle C. 'Sara' Bryant on 25 October 1877 at Falls County, Texas. Estelle C. 'Sara' Bryant was born in 1862 at Alabama. She married Robert Walter Lane on 25 October 1877 at Falls County, Texas. Estelle C. 'Sara' Bryant died before 1900. Thomas Allen Satterwhite was born on 18 June 1921. He died on 17 August 2006 at age 85; was found in the Social Security death index last living in Magnolia, Montgomery County, Texas. Thomas Allen Satterwhite II was born on 7 March 1947 at Harris County, Texas. He died on 4 July 1993 at Houston, Harris County, Texas, at age 46. Maude Merritt Philp was born on 17 January 1907 at Texas. She married Howard Stephen Satterwhite, son of Thomas Allen Satterwhite and Lillie Octavia Lane, on 13 December 1924. Maude Merritt Philp died on 4 April 1979 at Brazoria County, Texas, at age 72. Howard Stephen Satterwhite Jr. was born on 6 September 1929 at Wharton, Wharton County, Texas. He died on 24 September 1929 at Methodist Hospital, Houston, Harris County, Texas; I have copy of death certificate. He died after 24 September 1929 at Wharton, Wharton County, Texas. Pearl Marie Carroll was born on 7 June 1906 at Bryan, Brazos County, Texas. She married Lenoy Lenwood Satterwhite, son of Thomas Allen Satterwhite and Lillie Octavia Lane, on 7 June 1923 at Bryan, Brazos County, Texas. Pearl Marie Carroll died on 18 April 1986 at Houston, Harris County, Texas, at age 79. William Melvin Carroll was born on 22 November 1874 at Montgomery, Montgomery County, Alabama. He married Nettie Bell Phipps before 1901. William Melvin Carroll died on 30 November 1947 at Bryan Hospital, Bryan, Brazos County, Texas, at age 73; I have copy of death certificate. He was buried on 1 December 1947 at Steep Hollow Cemetery, Bryan, Brazos County, Texas. Nettie Bell Phipps was born on 24 October 1881 at Alabama. She married William Melvin Carroll before 1901. Nettie Bell Phipps died on 2 January 1947 at Bryan, Brazos County, Texas, at age 65; I have copy of death certificate. She was buried on 3 January 1947 at Steep Hollow Cemetery, Bryan, Brazos County, Texas. Pansy Louise Satterwhite was born on 17 September 1924 at Bryan, Brazos County, Texas. She married Lavern Coleman on 26 April 1944 at Houston, Harris County, Texas. Pansy Louise Satterwhite died on 2 November 1984 at Conroe, Montgomery County, Texas, at age 60. Lavern Coleman was born on 24 October 1921. He married Pansy Louise Satterwhite, daughter of Lenoy Lenwood Satterwhite and Pearl Marie Carroll, on 26 April 1944 at Houston, Harris County, Texas. Lavern Coleman died on 10 October 1990 at Conroe, Montgomery County, Texas, at age 68. Willian Glenn Maple was born on 7 September 1915 at Mulvane, Sumner County, Kansas. He died in April 2004 at San Antonio, Bexar County, Texas, at age 88. Brent Smith was born on 9 November 1977 at San Antonio, Bexar County, Texas. He died on 9 November 1977 at San Antonio, Bexar County, Texas. Billie Jeanne Satterwhite was born on 17 December 1926 at Angelina County, Texas. She died on 21 March 1933 at Montgomery County, Texas, at age 6; I have copy of death certificate.